Show off your love of the hit sci-fi series Doctor Who with this officially licensed carnival cup! The plastic cup with clear straw and screw down lid holds approximately 16 ounces and features the Doctor's time machine, the TARDIS! Dishwasher safe, not suitable for microwave use. Sure to make a great gift for your favorite Doctor Who fan! Show off your love of the hit sci-fi series Doctor Who with this officially licensed carnival cup! 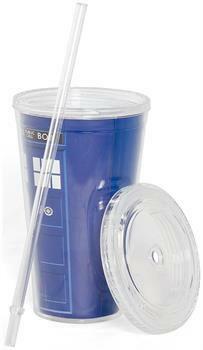 Plastic cup features the Doctor's time machine, the TARDIS! Dishwasher safe, not suitable for microwave use. Cup includes a clear straw and screw down lid.